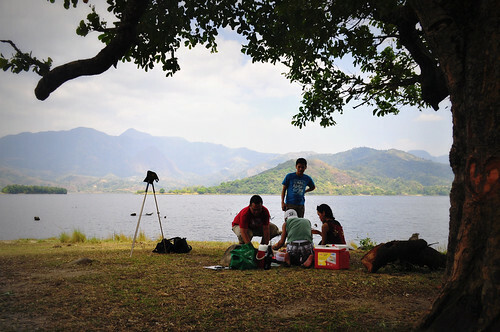 The gang was looking for an unusual roadtrip so I suggested Mapanuepe Lake after reading several blog entries about it. What's interesting about this lake is that it was formed after the catastrophic eruption of Mt. Pinatubo in 1991. Lahars traveled down the rivers of Mapanuepe and Marella that caused the waters to rise forcing the residents of Aglao to evacuate to higher grounds. 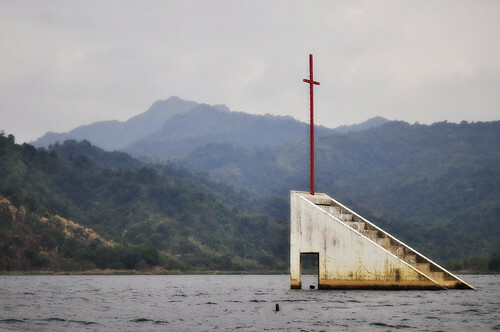 The original village of Aglao no longer exists and is now part of Mapanuepe and the only structure that remains is a church tower with a huge metal cross right in the middle of the lake. At first I was hesitant because the idea of going to a lake that formed from a submerged village could really scare the hell out of anyone but from the moment I saw the lake, I realized that it was just a silly thought. We were greeted by an old man who happens to be a resident of the village and we addressed him as Tatang. His house is actually the closest one on the lake and he was kind enough to let us park our car beside his garden. It's surprising though because he's used to seeing tourists visit the place even though there are only a few information that you could pull up online about the lake. It was fun because we had the lake all to ourselves and it was a perfect place to go on a picnic. Our travel buddy Kiko brought pasta and baby potatoes for lunch and we just spent the hours eating and relaxing under the tree with a laidback view of the majestic lake. Later on we decided to hire a boatman that could take us to the cross tower. One piece of advice, try to haggle down as much as you can because they will try to take advantage and rip you off. I can't blame them though. After the lake has taken over their lands and their main source of livelihood, tourism is their next best alternative and their only hope to survive. Our boatman wanted to charge us Php400 but we were able to lower it down to Php300. Yes, it's still a bit pricey but I guess this is the least that we could do to help them. The boatride was a little bumpy because it was windy that time and our boatman was trying to avoid several dead tree trunks which are still remnants of the old village. Unfortunately we weren't able to step on the cross tower because the waves were strong so we just settled for an upclose shot of the structure. After the boatride the gang went on for a swim but I opted not to because I never brought extra clothes. So I just made a little chitchat with Tatang and learned that before it was not safe to swim at the lake because toxic chemicals were spilled from a nearby mining site. 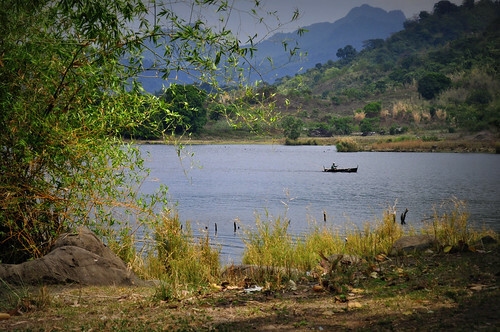 Eventually, the harmful chemicals were diluted so now the lake is safe for swimming and even fishing. Mapanuepe is such a beauty to behold but it's also sad to see how this lake has changed the lives of the people in Aglao. I do hope that they get more tourists in the future so that they could have a more stable source of income at least from tourism. Special thanks to Chyng for the providing us the info on how to go to this beautiful lake. By car: If you're coming from Manila, drive all the way to Subic and take the route going to Iba until you reach the town of San Marcelino. Make a right turn once you see the San Marcelino Market and drive straight to Barangay Aglao. 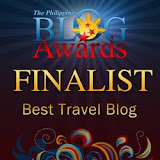 By public transport: Take the bus going to Iba, Zambales and then alight at San Marcelino Market. 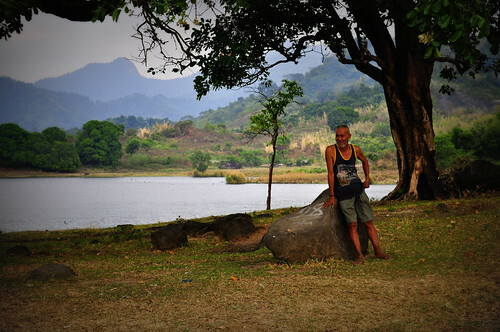 Ride a jeepney bound for Aglao and ask the driver to drop you off at the lake or 'lawa'. My relatives are from San Marcelino and they mentioned the story about Pili town when I was younger. Eto na pala yun hehe. Might as well drop by the next time i go to Zambales. hahaha... tama si chyng. marty's lang baon namin diyan plus delata specially prepared by a local household. i was with chyng awhile ago and too bad i was not able to reply your question on going there. my bad. busy person i am. 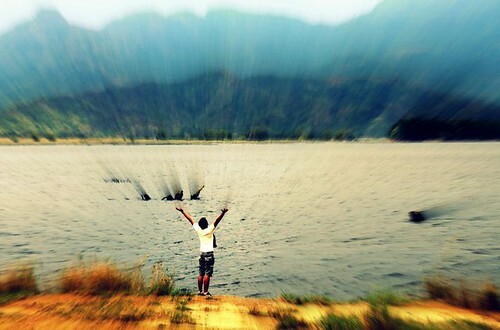 I've never heard of this lake before..
Gotta tell some of my friends..
Ganda ng lugar, plan ko din pumunta. Question lang po, yung mazda sedan ba gamit nyo papunta sa lake? 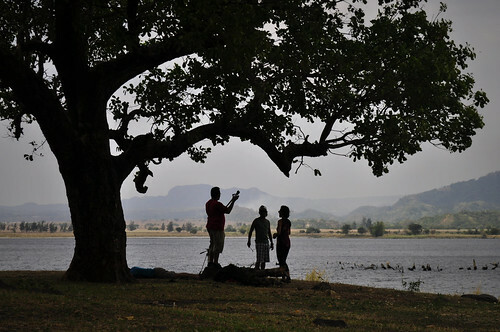 Nabasa ko kasi sa ibang blog na not advisable ang small cars sa dirt road leading to the lake. Sedan din kasi ang gagamitin ko kung sakali. Thanks sa reply kahit madaling araw. Galing nga ng sasakyan nyo, dumaan sa dirt road makintab pa rin hehe. Thanks for promoting our very own, Mapanuepe Lake. Hope you enjoyed the place. Some unusual place where I was is Thailand. Those view of landscapes are amazing. Interesting ladies walk on the street. Magic place for me was Chang Mai, there I found a lot of interesting places with the help of http://catmotors.net/ I rented a scooter, and just go away, where my eyes look. All what I saw was a special. Inlove with Chang Mai, I arrived at home, and paint a pic of my joyrney. It was nice trip to inspiration and self-development.